We saw a great opportunity to build better teams by freeing up scouts in the NFL to spend more time actually scouting for great players than searching, collecting, and entering data. “We’re not looking for the best players, we’re looking for the best players for the 49ers. The more you can analyze data, the better decisions you can make.” – Jed York, 49ers CEO The scouting process is complicated in nature. In order to evaluate players, the scouts watch players all over the country both in person as well as on film. They then form their opinions about the players and enter their evaluations in the system of record. Information also trickles in at different times from multiple sources like medical reports or workout reports at various football events. All this information needs to be looked at collectively. The scouts need to support their views with confidence and ensure that pertinent and up-to-date information about players is reflected at all times of the year. The management needs to be able to quickly access the most relevant information about a player and make decisions on whether to draft, claim, trade or cut a player. “The SAP Scouting app takes something that’s a 10- or 12-step process and makes it a four- or five-step process. There are reams of data on players, but it synthesizes all of that information and makes it clear and easy to understand for a scout, a coach or the ownership. That’s really important, because otherwise it’s paralysis by analysis.” – Paraag Marathe, 49ers COO Before SAP Scouting, in order to identify players of interest, the scouts had to sift through numerous, complex reports. The entire process of collecting information about players was very transaction oriented and time consuming. It was then difficult to connect the information together to form a holistic opinion about a player. 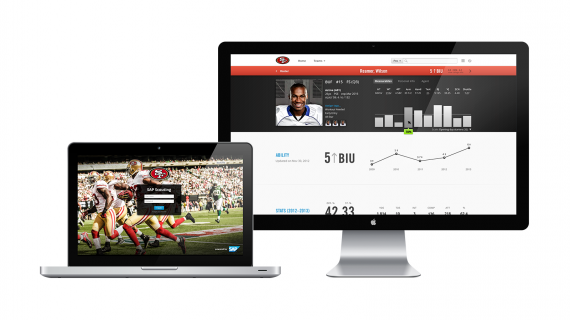 With the Scouting app we’re changing the process of evaluating both college and professional football players and helping teams make better hiring decisions. Our search capabilities distill the most important information about players into a single screen, which allows for easy filtering and quick comparisons. Our player profiles reflect all available information about every single college and professional player in real time. Scouts can find relevant data right away, without having to browse different resources. “At the start, I was skeptical as the perception was that SAP was coming from waterfall and old school methods. But, Design Thinking has been one of the best exercises in moving very fast and coming up with precise requirements like a tech startup does.” – Kunal Malik, 49ers CTO Our primary goal with the SAP Scouting app was to provide a tool that would simplify the process of scouting players and allow the scouts to do what they are really good at – finding the best players for their teams. Our understanding of the scouting process came from close collaboration with the 49ers and we chose words and metaphors that spoke their language. We chose a clean, minimalist design to visually organize, clarify, and communicate data-intensive information that the scouts can efficiently digest. By taking a simplistic approach to design, we allowed the information to speak for itself without distracting the user with arbitrary design elements. Scouts typically sit in a dark room watching many hours of player videos and expressed frustration with the dark palette on their current system. The final design was bright, engaging.